All my friends and well-wishers and readers of this blog, I have been getting constant mails, chats and even messages on what plans I have on my Husband's Birthday. Well its time to reveal :D, this time around I had main focus to bake him a cake, wait bake 2 cakes and this is my very first attempt to make a Birthday cake. 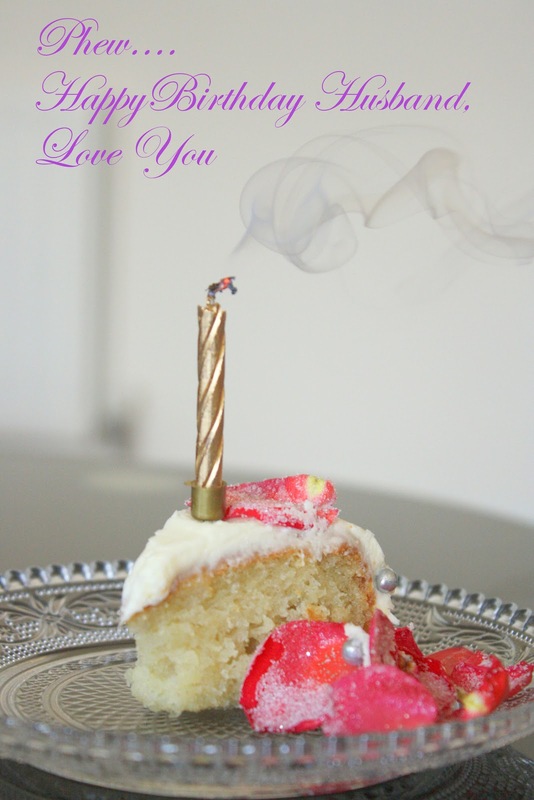 Like I had mentioned in my earlier post on ideas for Husband's Birthday, I incorporated one of the idea, which is to do what he likes and why not its his special day. So like most busy housewives I was planning my husband's birthday for nearly a month (too much huh?). I love to put in all my best efforts and ideas and to tell you he was just blushing the whole time :-), I thoroughly enjoyed if every bit and made me think of the earlier days before marriage when we used to meet and blush :P.
Alright going to what I had done, I made some lamingtons. Ok not just some, quite a lot around 60 pieces which took me nearly 2 whole days. Now I know you might ask why 60, well he is not that old (will reserve his age for his sake ;-), I had promised to send some to his friends at work. 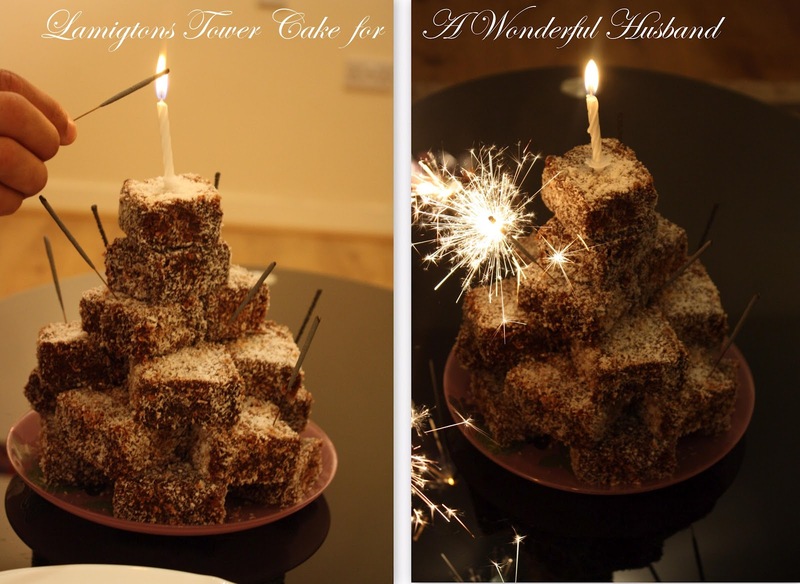 And I did make a tower of Lamingtons and added a candle, sparklers to make it even more surpricy. Made him cut the lamingtons at 12 midnight and he was so pleased. His Verdict: He loved that the cake was less fatty and the cake was a totally pleaser, spongy, moist and just melts in you mouth. He totally went bonkers for the crystallised roses. 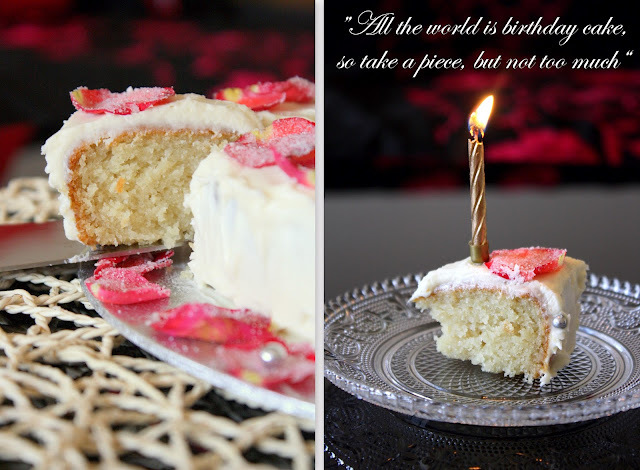 Well the cake did win his heart and he told me this "This is the best Birthday cake I ever had" and I said "Me too :P", now tell me what else could make my day even special? My Thoughts : This is a super easy cake and you do not need a whisk (electric/ free stand) to do the cake and just a spoon is more than enough to beat the ingredients. Its quick to mix and easy to do. Although the cake was eggless and butterless, it did not feel or taste different, and in my opinion it was too good. The icing gave a lovely balance to the cake. Preheat oven to 350F / 180C and grease an 8" cake pan (or loaf pan) with some butter or oil and set aside. In a bowl sift the flour and set aside. In another large bowl beat the yogurt with a spoon to remove any lumps and add the sugar to it, beat again and wait for the sugar to dissolve well, this would take 5 mins. Now add the baking powder and baking soda to it. Beat again and set aside for 5 mins until you see small bubbles on the surface of the mixture. In a large bowl using a hand-held or free-stand mixer beat the butter until soft and gently add the icing sugar 1/4 cup each time and beat well. You will find the color changing from yellow to light cream color. It took straight 15 mins for me to get to this consistency, add milk to loosen the mixture. - If your cream is still yellow either you need to whisk for a longer time or this could be cos of the butter you had used, they say that cow's milk butter gives a yellow tint. I made the crystallised flowers a day before so that they can dry up well. I left it in the kitchen counter top and it dried perfect. Since I did not layer the cake i did not divide it to two, its upto you if you want to layer the cake double the quantity and divide in the center. Drop tbsp size icing on the cake and start spreading it with a off set spatula and create swirls, peeks or just vertical streaks with them. - you can use leaves and small fruits to crystallise but I have not tried it. In my opinion its best to get roses from a florist and make sure they do not spray harsh chemicals onto it. 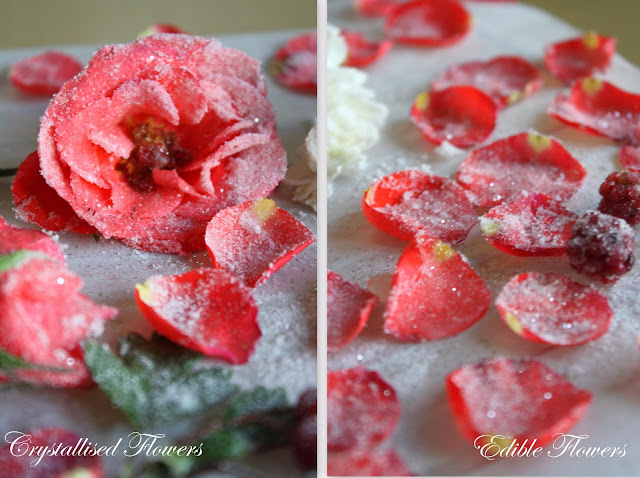 On a personal note we did not eat the petals and I have reserved them to see how long they last. WOW!!! beautiful cake....lovely card....loving verdict from your hubby.. good job Priya! :) love your crystalized flower. Awesome cake. Good idea. Nice clicks. wow......wonderfully celebrated his birthday priya. Belated Happy Birthday to him. Cake, card and lamigtons awesome! I am spell bound now to see these all. Great job done dear. I dunno who is lucky here, you or he:)..You guys both are lucky for me, seems he thoroughly enjoyed all ur surprises and beautiful cakes..Loved both cakes. OMG, cant take my eyes out of the cake...very well done... Lovely work... Good work Priya!! Wow! OMG! happy birthday to the lucky one...God bless!! That i bet ur hubby was pleasantly surprised by the awesome cakes:-)Both cakes look stunning! wow...cake looks perfect...wonderful photos as well..love the last one very much...simply kidos..
Tantissimi complimenti e un grosso bacio!!!! delicious dear...join me in know your flours- corn flour event in my blog. 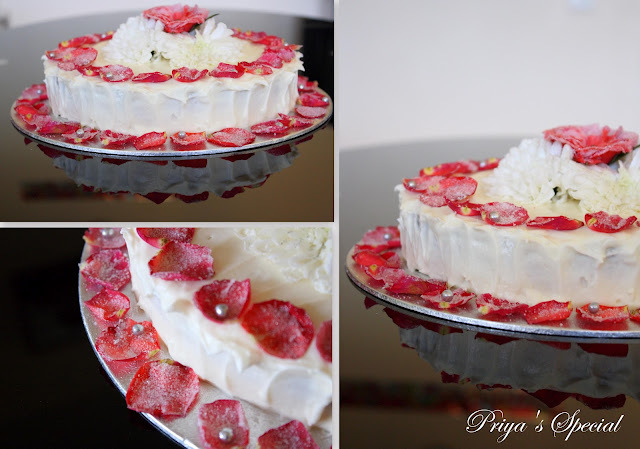 such an apt lovely sweet b'day gift to your better half!superb presentation as well..may god bless both..
Wow it is awesome dear,gorgeous cake and the lamingtons too,love the idea of crystallized flower,you rock Priya. Belated B'day wishes to your hubby..
You done wonderful job. Your hubby will be happy. Beautiful cake Priya. You made his birthday very special. Nice way to celebrate our beloved ones birthday..Cake looks perfect in texture and color combination..Hope your husband enjoyed your birthday surprise..My bday wishes to him.. Thanks for your lovely words dear..
What a beauty! Lucky him. 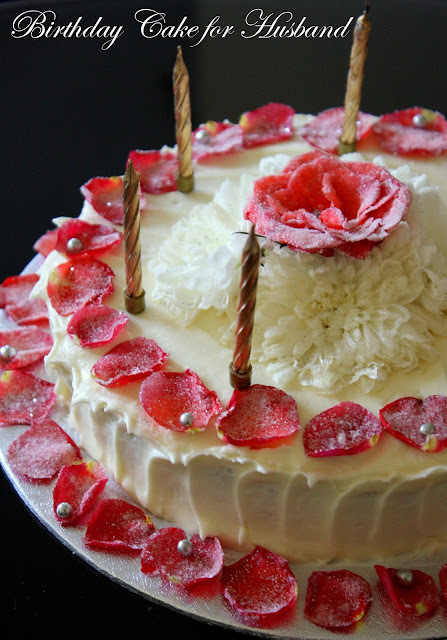 cake looks great and the way you celebrated is lovely and fantastic Priya! What a lovely post.. this shows your love really.. Nice clicks as well Priya.. Thx for dropping in my space when you posted such a lovely post @ ur space (This cake).. coz, i got a chance to visit ur space n follow u.. :) keep rocking.. Brilliant idea dear. Cake looks very pretty. Well wishes to ur hubby and u all. Your husband is so lucky to have a loving wife like you. God bless you both. Thanks for visiting my blog - you have a lovely space yourself. Take care. 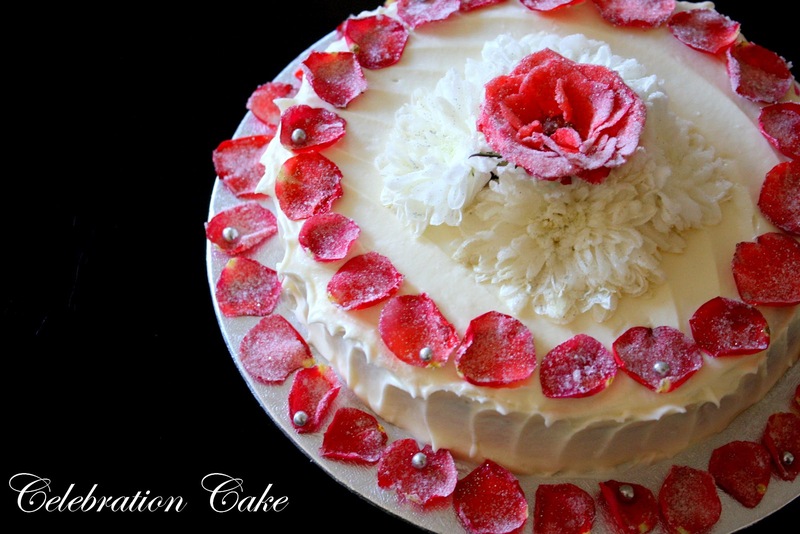 Wow.....Wonderful Rose cake. nice gift to your husband.thanks....for dropping by my space,happy to follow u. 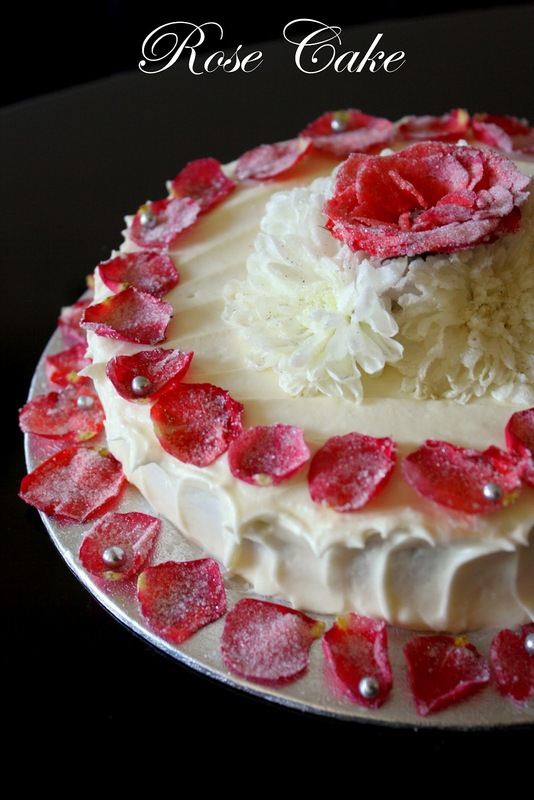 Your rose cake is so pretty Priya! So much love and care you put into it. The Lamingtons look yummy too! Ranjit is one lucky dude :D. Anya & I liked your site very much. Very nice post...beautiful cake... I specially like those pieces in dim light.. nicely captured !! Is it necessary to use backing powder and backing soda? Awesome, awesome, awesome, lucky guy huh.., can see all your love in it Priya, b'day wishes to your dear one..
wow. he must be so overwhelmed by surprises. so beautifully decorated cake. GOD bless you both. 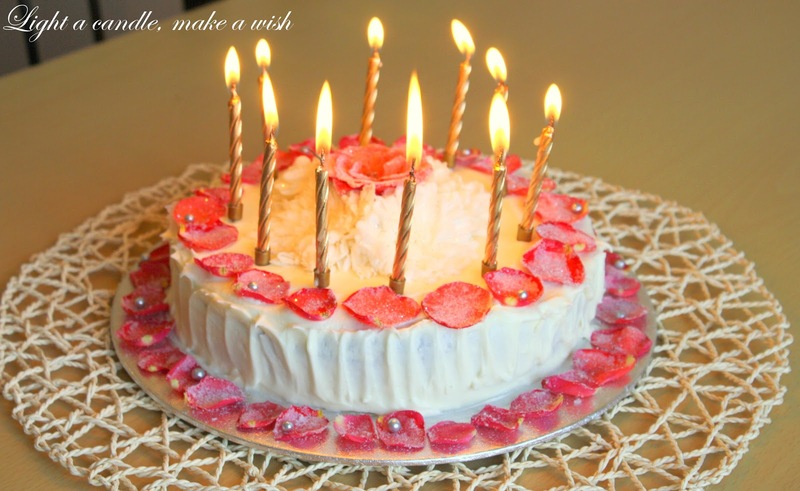 Belated b'day woshes to your hubyy, that cake looks so beautiful and i am sure he was thrilled when he saw this cake. Looks Delicious..wishes to ur H.
wow wo wow...Delicious and the cake looks fabbbb...Gorgeous white..Ur husband is very lucky dear.. Awesome cake cant wait to taste it!! !I wish I was beside ur home!!! Its really looking very creative and yummy.I am not able to take my eyes from the cake for a minute.Good jop priya.must try recipe also. Loved reading through! Lovely post! You have put in so much of thought and effort, looks delicious! Very interesting post, it really inspiring me. This cake is really a perfect present especially when its partnered by some warm birthday wishes that are comes to the heart, that so sweet though. Anyway, thanks for sharing :) Well done !! Hello, How did you get those white flowers on top of the cake where you placed whole red rose.. Did you do that with the frosting or are those real flowers too? Those white flowers are real ones, I wanted to place the center rose and I used the white flowers to help it stand.